Police officers in rural areas fear they would be "sitting ducks" in the event of a terrorist gun attack in the UK, a Police Federation chairman says. A national shortage of armed officers could leave police in isolated areas "unarmed and vulnerable", John Apter, head of the Hampshire branch warned. Figures revealed the number of firearms officers in England and Wales last year fell to its lowest level since 1987. Home Secretary Theresa May spoke at the Police Federation conference earlier. The federation, which represents constables, sergeants and inspectors in England and Wales, is holding its annual conference in Bournemouth. They paused during speeches on Tuesday morning to hold a minute's silence to remember the 96 victims of the Hillsborough tragedy. Do police have firepower to tackle gun menace? Speaking to BBC Radio 4's File on 4, Mr Apter said armed officers could be more than 70 miles away if an attack was launched in a rural location. Some rural and coastal areas include potential terrorist targets - including energy and power plants. Nuclear power plants in Britain are guarded by the Civil Nuclear Constabulary (CNC), whose officers are routinely armed, while firearms officers of the Ministry of Defence Police are responsible for facilities such as the Atomic Weapons Establishment at Aldermaston in Berkshire. "Being realistic, if a firearms unit was coming from the middle of the county you are still talking about 30 miles away - you are not talking about a few minutes," he said. "There would be an understandable delay. "If a firearms unit is the other side of the county they could be 70 miles away so you are talking a significant distance. "So the only officers that you have available are unarmed and vulnerable officers and they are the officers that are saying to me that in a terrorist situation they would be sitting ducks." Last month, Prime Minister David Cameron announced money would be ring-fenced to boost the number of firearms officers in the UK, following terror attacks in Brussels and Paris. However, federation chairman Steve White said the government's plan to train another 1,500 firearms officers to deal with the terror threat looked doubtful. Officers are not volunteering to carry guns because they fear being "hung out to dry" and treated like a suspect if they discharge their weapon, he said. The result was "worrying" inconsistencies in the service nationally, leaving some forces without firearms officers and reliant on neighbouring forces for coverage, Mr White added. 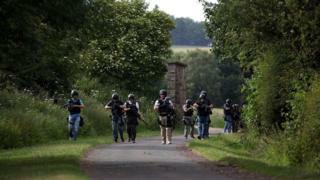 A national shortage of armed police was leaving the UK vulnerable to terror attacks, he warned. The head of the Independent Police Complaints Commission (IPCC), which investigates fatal shootings by officers, said while firearms officers should not have impunity, they should also not be concerned by the watchdog's scrutiny. In a statement, IPCC chair Dame Anne Owers warned "those within the police service" to be careful "about stoking such fears". The IPCC had investigated 29 fatal shootings by police in the past 12 years, the statement added, and had only used its powers of arrest once. Che Donald, from the Police Federation, warned the recruitment drive could create a "gap" in the front line, as armed officers transferred from neighbourhood policing. "There isn't a magic pot we can just dip into and pull out a fully trained firearms officer," he said. CNC Deputy Chief Constable Simon Chesterman, the national lead on armed policing, said those concerns surrounding recruitment were starting to be tackled. "At the moment this is not a crisis, but quite clearly, with some of the things going on in the background that are putting pressure on them, it could become one. "At the moment, sufficient officers are stepping forward but we're watching and monitoring it very carefully." Police minister Mike Penning said the government had committed an additional £143m over the next five years to provide "a national uplift in armed policing capability". Downing Street said police forces were recruiting more than 1,000 armed officers, setting up round-the-clock specialist teams outside London. More than 40 police armed response vehicles will also be deployed. "We will always ensure firearms officers are supported to take the difficult decisions necessary to protect the public," he said. File on Four is broadcast on BBC Radio Four on Tuesday 17 May at 20:00 BST.